The CICIG's mandate is unprecedented among UN or other international efforts to promote accountability and strengthen the rule of law. It has many of the attributes of an international prosecutor, but it operates under Guatemalan law, in the Guatemalan courts, and it follows Guatemalan criminal procedure. 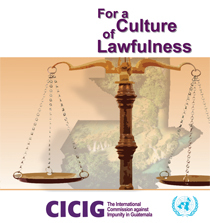 CICIG carries out independent investigations into the activities of illegal security groups and clandestine security structures, which are defined as groups that: commit illegal acts that affect the Guatemalan people's enjoyment and exercise of their fundamental human rights, and have direct or indirect links to state agents or the ability to block judicial actions related to their illegal activities. The influence of these groups within the State is considered to be one of the cornerstones of impunity in the country and a major obstacle that impedes efforts to strengthen the rule of law. Although CICIG investigates and participates in the criminal prosecution of a limited number of difficult and sensitive cases, it also works to strengthen the country's public policy framework and fortify Guatemala's justice sector institutions. To this end, CICIG makes proposals for legal reforms, works closely with selected staff from the Public Prosecutor's Office (MP) and the National Civil Police (PNC) to enhance expertise in criminal investigation and prosecution, and provides technical assistance to these and other justice sector institutions. The goal is to leave these institutions in a stronger position, with new in-house capabilities to tackle similar cases in the future.